So why did the northsider cross the river? To get to Springvale of course! OK so pretty lame joke but for me there's a lot of truth in it. I just learned the extremely disappointing news about the impending demolition of Little Saigon Market in Footscray which saddens me immensely. Thinking about losing this wonder of Melbourne reminds me of the day when we fist stumbled into the wonderland that is Little Saigon Market. I can remember feeling so excited that after almost 10 years living in Melbourne there were still such interesting and unique places like LSM that were yet to be discovered. This feeling left me wondering what else was out there that I didn't know about. After a bit of research and asking around I was hearing things like "If you like Footscray, you'll love Springvale!" So of course I ventured out there that weekend and after hunting down a carpark I wandered around in heaven for and hour or so with a huge smile plastered over my face. I'm still a relative newcomer to Springvale but I actually find that quite exciting as it means there is still so much more to discover. For me it's a bit like still having a pile of Christmas presents under the tree just waiting to be unwrapped. On this latest visit I was set on working my way through the list of awesomely authentic Thai restaurants that reside there. I wasn't sure which one to start with but after snagging a great carpark, we locked the car and turned around to see Me Dee Thai and the decision was made. I had read about Me Dee on Kat's blog Spatula Spoon and Saturday and had always wanted to try it but until now I hadn't been able to find it. The Me Dee menu is awesome and to my eye very authentic. It certainly makes choosing difficult, a problem that will be overcome by my already planned multiple return visits. First up was Crab Fried Rice (Khao Phat Poo) and it was as delicious as it looks. 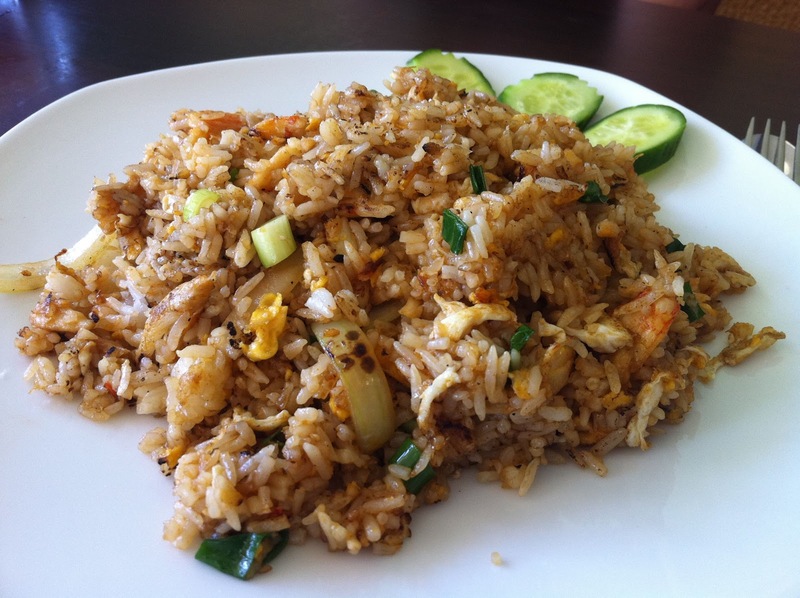 Beautiful wok seasoned smoky fried grains of rice with really healthy big chunks of crab meat. There's only one thing better than picking your way through a freshly fried pile of crab claws and that's when someone else goes to the effort of getting all the flesh out for you! It's one of those things that if I was rich, I'd happily pay someone to do for me. The slices of cucumber on the side is a wonderfully refreshing accompaniment that I am really developing a taste for. Every time we eat at a Thai restaurant I make sure we order at least one Thai salad and the fantastic range on offer at Me Dee made choosing difficult. 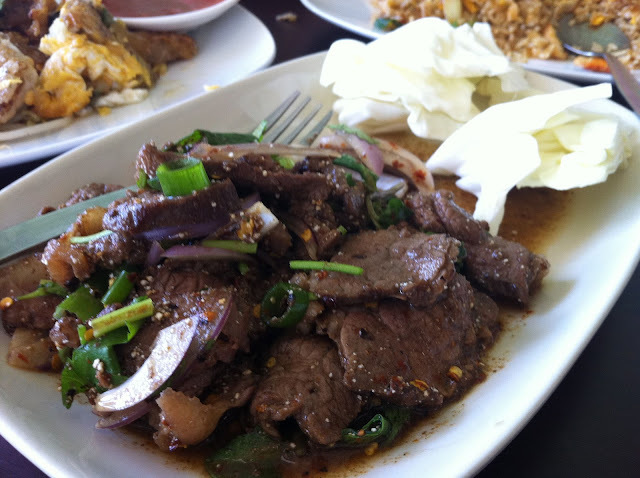 We opted for the Grilled Beef Salad (Yum Num Tok) and it was superb. Thai salads are often very simple in construction which belies the complexity of flavour they impart and this was a perfect exponent. The beef was almost buttery in texture and so beautifully seasoned, chewing was almost unnecessary! I've tried cooking my fair share of Thai beef salads at home and I can testify that getting that smoky flavour while keeping the subtle tenderness of the beef is definitely not easy to achieve. I've mentioned the toasted ground glutinous rice (Khao Khua) before but it seems remiss not to point it out again, it adds so much to both the taste and texture of this dish. Again, don't dismiss the crunchy cabbage side, its a wonderful fresh compliment to the richly flavoured beef. One of this Thai dishes that you very rarely see is Hoy Tod. This is a mussel (and sometimes oyster) omlette that's made with a rice flour batter and eggs and is always eaten with a spicy sriracha style chilli sauce. The Thai claim that it makes an excellent hangover cure although I understand the thought of eating mussels for breakfast while hungover might be a bit too much of a stretch for some. Plump juicy burst in the mouth oysters are even more confronting. Not for me though, I love it! (Either hungover or as is less often the case not) In Bangkok the Hoy Tod vendors often also sell Phad Thai. I first tried Hoy Tod at a little place in Sukhumvit and while it was quite confronting at first I ended up thoroughly enjoying it, you can check out my not so great photos here. The Phad Thai was pretty great too. We're heading back to Bangkok in June and we both can't wait. Hoy Tod is one of my many many 'must eat again while we're there' dishes. The Moo Ping (Grilled Pork Skewers) were absolutely divine. One of the great things about the Street Food in Bangkok is that you get to see how the food is prepared and cooked. In Melbourne this isn't so easily achieved although I am partial to a visit to the bathroom which hopefully requires a walk through or at least within eyeshot of the kitchen and of course I try and sneak a gander at as much as possible. Whether it be what's cooking or what brands of sauces or noodles are being used. I try not to be too snoopy but there are so many questions that I want answered I can't help myself. Unfortunately Me Dee didn't give me the chance for any snooping but if they did I would definitely be looking to see whether there was a charcoal fired grill going on in the kitchen. There had to be, I just can't understand how they could achieve the beautifully smoky grilled flavour of this Moo Ping with out one. For drinks we had a round of Cha Yen (Thai Iced Milk Tea) and we also couldn't resist the pineapple smoothie which Charlie just loved. I have never been a big fan of iced tea of coffee until recently. We discovered Cha Yen at the Nang Loeng Market in Bangkok (bad photos again, sorry) where we were drawn to a man who was pouring an orange brown liquid from jug to jug in a grandiose fashion which I later learned was to aerate the tea. 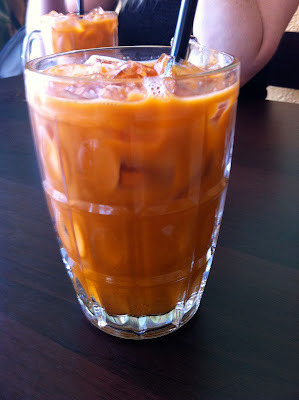 It's just perfect to combat the exhausting heat of Bangkok and while the Melbourne weather at the moment doesn't quite justify an icy caffeine hit I still can't help myself. So as I was once told, "If you like Footscray, you'll love Springvale." I find it interesting the way it seems to have divided itself into a Vietnamese section and a Thai section. Lately I have been more obsessed with the Thai section probably because I get my Viet fix from Footscray most weekends. 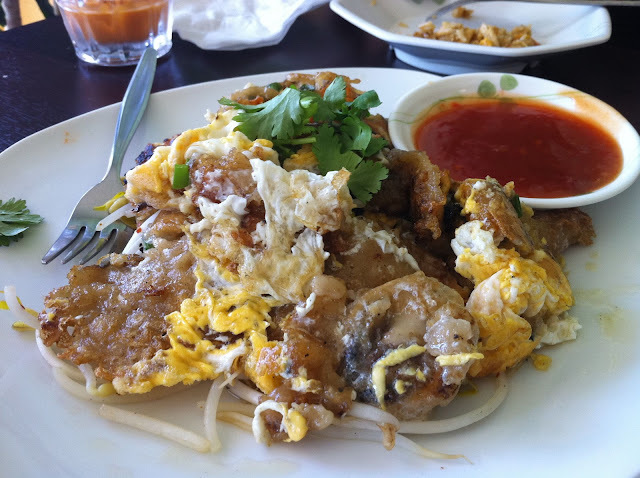 Unfortunately I am no closer to my goal of trying all the Thai restaurants in Springvale as I am really going to struggle to not go straight back to Me Dee on my next visit as there were so many meals on their menu that I want to try. Right up the top of that list is the Duck Egg Noodle Soup (Bamee Kuay Tiau Ped?) as you almost never see this offered anywhere in Melbourne and when cooked well is just sublime. We both still salivate just thinking about the many times we ate it in Bangkok. Also on my must try list is the Me Dee Boat Noodles (Kuay Tiau Reua). Regular followers of this blog will already know that I am totally obsessed with Boat noodles and hope to one day soon sell them in Melbourne at my own Popup Street Food Stall (stay tuned). Me Dee has been a favourite spot for both myself and my Thai wife for many years already. There aren't too many places in Melbourne dishing up such simple, affordable, authentic Thai food. Fifteen or sixteen years ago, every weekend we would head to Richmond for our shopping and to eat Thai food. A few years later we discovered Springvale, and since then it's rare we bother heading to Richmond. Happy to catch up with you over in Springvale one day and point out a few spots. There's no doubt in my mind that Springvale is the best place to shop if you are interested specifically in sourcing Thai ingredients. P.S. Have been getting loads of enjoyment from your blog since discovering it (by accident) a few weeks ago. Once again, I completely agree with you. 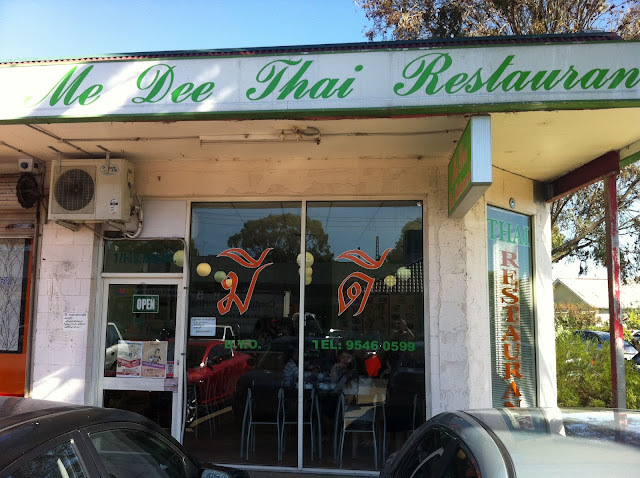 Me Dee was awesome but I'm sure there are many more excellent Thai offerings available in Springvale. 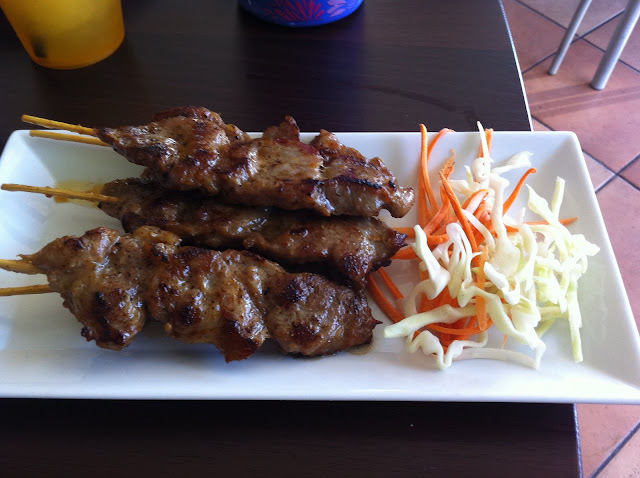 As you say, Richmond is OK but when it comes to Thai food, Springvale is king. I like how each restaurant usually has a different specialty or that one dish that no-one else serves. These are these meals that get me most excited. 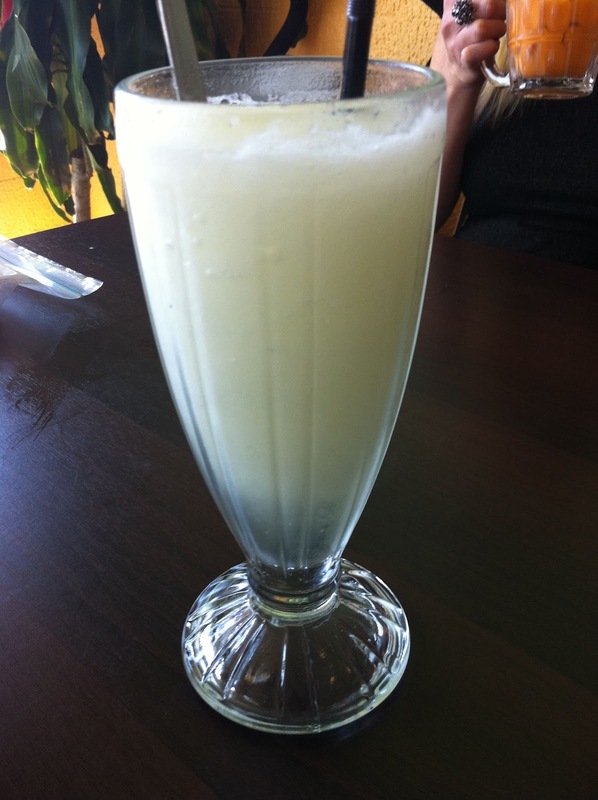 I'd love to meet up with you for lunch in Springvale, there's nothing like a bit of local knowledge thats for sure. We'll be heading out that was again very soon, possibly next weekend, I'll contact you to work out the details. Thankyou so much for the positive feedback. It's really nice to know that the effort is being appreciated. I'm interested to know how you found it, but we can talk about that any many other things Thai next weekend. I saw your photos of Nahm on fb, what an unbelievable place that is! We've been twice and will struggle not to go again when we're back in BKK in June. David Thompson is a genius! You may have already seen it, but this is our post (via iphone so not great photos) of our last visit. (http://krapow.blogspot.com.au/2011/11/nahm.html) Ohhh I just saw the photo of his durian sticky rice... heaven!!! Hi Andy, Thanks for your blog: a new discovery for me. The good news is that the Little Saigon Market in Footscray is being redeveloped, not demolished. The owners have permission for a multi story thing with the markets returning to the bottom story. I am guessing that the current LSM stall holders will relocate for the build period. There is vacant space in the new mall over the road after all. Hi Andrew, thankyou for the update on Little Saigon. Let's hope the new development retains some of the character that is so unique to the current market. In the meantime I have resolved to enjoy LSM as much as possible. I'm glad you are enjoying the blog and thanks again for the comment.